Since March 2015, the conflict in Yemen has greatly affected both Yemenis and migrants and the closure of most of Yemen’s ports is preventing migrants from returning home on their own. Through its Voluntary Humanitarian Return (VHR) programme, IOM is providing transportation and return support from Yemen to the migrants’ final destinations in their home countries. The journey for 36 Ethiopian migrants stuck in Sana’a started last Saturday (10/03), when IOM transported them by bus to the port of Al Hudaydah. There they joined a further five Ethiopian migrants, who were staying at IOM’s Migrant Response Point (MRP). IOM’s MRP provides shelter, food, medical assistance and other humanitarian support for stranded migrants. Following exit formalities, a total of 42 migrants (41 Ethiopians and one Croatian) boarded the ship and departed from Al Hudaydah Port for Obock, Djibouti. On arrival, they were met by IOM staff, who assisted with their onward travel to Ethiopia. 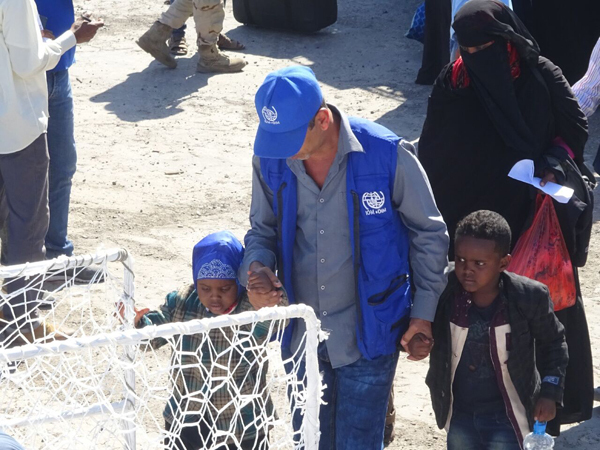 On the same day (12/03), IOM in coordination with UNHCR, the UN Refugee Agency, helped 144 Somalis refugees depart Aden to return home. This group were assisted through the Assisted Spontaneous Return programme (ASR) for Somali refugees in Yemen, which is carried out in close collaboration with the Yemeni Authority, Somali National Commission for Refugees and Internally Displaced Persons (NCRI) and the Somali Consulate. “Every month, around 10,000 migrants enter Yemen. Usually their hope is to reach the Gulf countries but they often become targets of the conflict, seldom making it to their destinations,” said Khan Aseel, Officer in Charge of IOM’s Hudaydah sub-office. “After being misled by smugglers, they are left stranded and destitute in Yemen, while also at risk of further abuse by smugglers, as well as the effects of the ongoing conflict. Migrants face a variety of dangers, from death due to starvation and dehydration during the journey to exploitation and abuse like abduction, forced labour, sexual abuse, torture and threats once in country,” said Aseel. “After facing desperate circumstances, it is extremely important that a safe route home is available to them. Often migrants can be overlooked during such a crisis as Yemen, but IOM is committed to providing a way for them to get home,” added Aseel. So far in 2018, IOM has helped nearly 660 stranded migrants return home from Yemen, while in 2017, 2,860 were assisted. IOM’s 2018 return movements from Yemen are currently funded by the US Department of State Bureau of Population, Refugees, and Migration (PRM), the German Government and the Swedish International Development Cooperation Agency (Sida).